G-20 Leaders Focus On Stabilizing Economies President Obama will be among the leaders of 20 top economies meeting in Pittsburgh to discuss global economic issues, including ways to attempt to stabilize banks and financial markets. 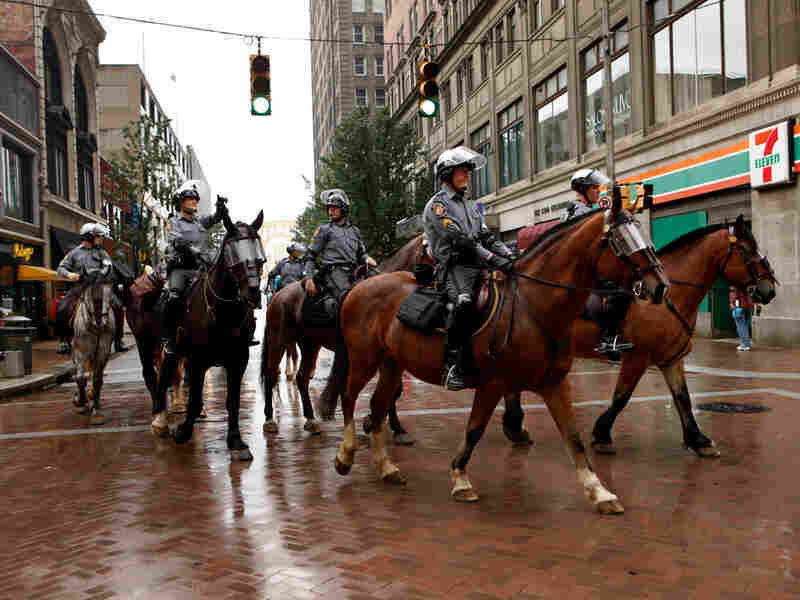 Mounted police patrol the streets of downtown in preparation for the G-20 Summit in Pittsburgh, Pa.
President Obama joins leaders of industrialized and developing economies Thursday at the G-20 summit in Pittsburgh, hoping to convince them to transform the global economic crisis into an opportunity to permanently stabilize banks and financial markets. The president is expected to tell fellow leaders that the old economic model of massive Chinese exports being snatched up by borrow-and-spend consumers in America and elsewhere is unsustainable. In a preview of that message at the United Nations on Wednesday, Obama said, "Now is the time for all of us to take our share of responsibility for a global response to global challenges." The leaders of the Group of 20 nations are meeting for the third time since the financial crisis threw growth into reverse a year ago. When the body last met in April, many economies, including the United States, were under severe strain, and world leaders largely agreed on common remedies such as dramatically increased government spending to provide some stimulus. With the crisis calming, summit leaders are set to discuss how to redirect their focus on reinvigorating their economies without repeating past mistakes. Obama will propose a gradual elimination of extensive government subsidies that encourage the use of fossil fuels that contribute to global warming, White House officials say. Many countries, including the U.S., provide tax breaks and direct payments to help produce and use oil, coal, natural gas and other fuels that emit carbon dioxide, a gas that traps heat in the atmosphere. China and India, both rapidly industrializing, energy-hungry economies, are likely to be obstacles in the president's plan. The issue of capping pay for bankers and financial executives is also likely to be addressed, but there is little expectation of any solid movement. French President Nicolas Sarkozy has proposed capping compensation for bankers. Dan Price, then-President Bush's chief aide at December's G-20 summit, says Sarkozy's proposal is a distraction. "Fortunately, President Obama and his advisers are on record opposing that, and rightly so," Price says. "So, as I say, the final risk is the possibility ... that something kind of hijacks the attention and becomes a distraction from the important work of reform." The G-20 leaders will likely endorse a set of compensation guidelines, without caps. They will also likely address the issue of requiring banks to hold more capital, which would cushion against losses so banks remain solvent when things go bad. Obama plans no one-on-one meetings with world leaders or extensive discussions of Iran, White House officials said late Wednesday. European leaders are pressing for a deal on financial regulation reforms, but Obama's agenda is pressing for policies to even out the trade imbalances between China and the United States. British Prime Minister Gordon Brown told reporters in New York on Thursday that Britain and the U.S. "would like to see China importing more from our countries." Japan's new prime minister, Yukio Hatoyama, said his nation wants to be part of the discussion to "rein in the issues of poverty and economic disparity, which are difficult to coordinate by simply leaving them to market mechanisms." Obama and first lady Michelle Obama will greet their guests at a "working dinner" Thursday at Pittsburgh's Phipps Conservatory and Botanical Gardens. Friday will feature group sessions on various topics, and a presidential news conference.